Red Hat® Cloud Infrastructure enables you to build and manage a private cloud environment. Red Hat Cloud Infrastructure enables you to build and manage a private Infrastructure-as-a-Service (IaaS) cloud based on datacenter virtualization and management technologies for traditional workloads. It also provides an on ramp to a highly scalable, public-cloud-like infrastructure based on Red Hat OpenStack Platform . With Red Hat Cloud Infrastructure, you can implement an integrated infrastructure to deliver services faster, increase your IT department’s value, reduce total cost of ownership (TCO), and improve manageability. Red Hat Cloud Infrastructure’s integrated components work alongside your existing infrastructure investments and let you tailor a cloud to your environment and needs. With Red Hat products based on open standards, you're never dependent on a single vendor. Management spans multiple virtualization technologies, Red Hat OpenStack Platform , and public cloud providers like Amazon Web Services and Microsoft Azure. Red Hat Cloud Infrastructure offers automated provisioning, configuration management, and software management of Red Hat Enterprise Linux and any RPM-based application. We've earned top virtualization benchmarks for performance and scalability in SPECvirt . Red Hat is a leader in the OpenStack and Linux communities. CloudForms gives you choice and flexibility while providing a unified and consistent set of management capabilities across virtualization platforms, private cloud platforms, and public cloud platforms. CloudForms can see and manage both the guest and host systems, allowing management of workloads and infrastructure within the same system. 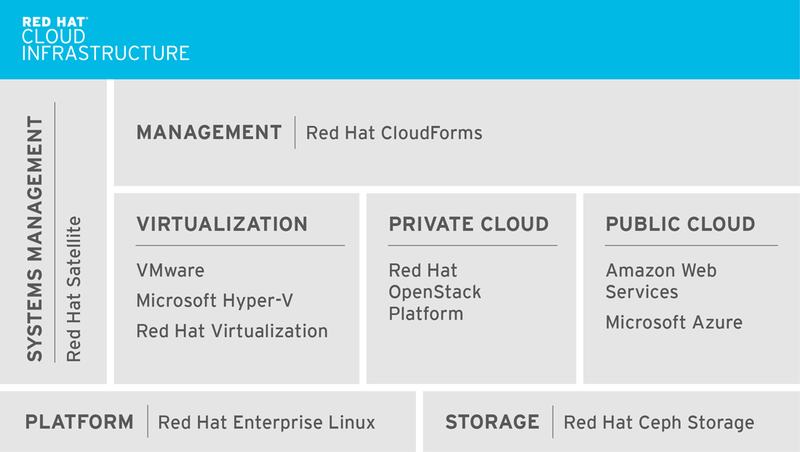 Which Red Hat products from the Red Hat Cloud Infrastructure do you want to deploy? Which do you already have deployed? On-premise cloud deployments continue to increase in popularity and demand. As demand increases, IT leaders look for ways to reduce time to deploy, configure, and implement management capabilities for deployed environments. This article tells you how to setup a role, a group, and a user for access to a specific cloud provider and, using an example, it helps you establish a foundation for your Red Hat Cloud Infrastructure user environment.